Terms: Based on availability; Hotel blackout dates may apply; New reservations only; cannot be applied to previously booked rooms; This special is only combinable with Resort Coupons; Offer may be withdrawn at any time. Terms: Minimum stay 3 nights; Based on availability; Hotel blackout dates may apply. New reservations only; cannot be applied to previously booked rooms. Resort Coupons cannot be exchanged for cash. There is no cash reimbursement if unused. Resort Coupons promotion is not combinable with other credits, discounts or promotions unless specifically indicated. Resort Credits are not transferable, non-cumulative and cannot be held over for future stays. Promotion, prices and applicable services are subject to change without prior notice. ; Offer may be withdrawn at any time. 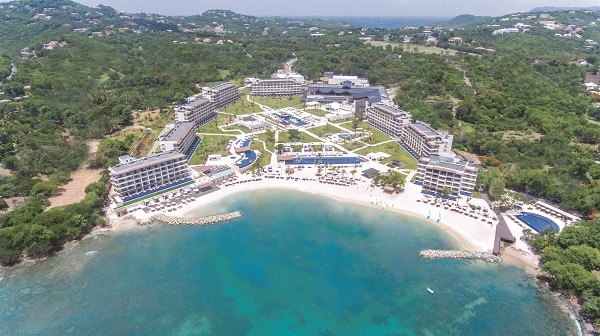 Nestled in lush a landscape and set upon one of the most picturesque islands in the Caribbean, Royalton Saint Lucia welcomes each guest on a vacation in upscale style and comfort. Discover modern facilities, warm staff, and an exhilarating locale, rich with culture and world-class cuisine, which creates the perfect backdrop for an unforgettable All-In Luxury® escape. Designed for travelers of all ages, this modern resort features three distinct sections offering a family friendly vacation experience in the general resort, Diamond Club™ for a higher level of service and exclusive pool, beach and dining areas and tranquil Hideaway, an adults-only oasis. • Watch chefs in the open kitchen as they perfectly prepare your steak. • Masterfully prepared teppanyaki and fresh sushi right before your eyes. Children age 4-12 enjoy innovative daily activities at our supervised kids clubs, featuring popular characters Max & RubyTM and Mike the KnightTM, games, cartoons, and a playground. Stay cool in the splash pad for a refreshing take on sunbathing. Including a hydrotherapy circuit and a full range of massage, body and facial treatments. Complimentary features include unlimited long distance calls to North America and parts of Europe from your room and enjoy high-speed Wi-Fi resort-wide. Also enjoy the convenience of in-suite Bluetooth audio stations and USB recharge outlets. The free Royalton app offers an unlimited free calling plan from your mobile device while on property.